11 Business Hacks To Help Your Business Thrive! Understand what is really holding your business back. Unfortunately the reality is it’s probably you! In our experience many businesses are on the verge of thriving but the beliefs, mindset and actions of the owners is what is holding the business back. So have a good look at yourself as a business owner and seek to understand what your limiting beliefs are. Many business owners spend all their time working IN the business. That is on the tools, floor etc and ‘stuck’ in the daily grind of keeping the doors open. Start spending some time working ON the business. Overviewing the strategy, putting a game plan in place and introducing new ideas and thoughts. We always recommend that this is done outside of the business premises. It could be a coffee meeting to get the ideas flowing. “By failing to prepare, you are preparing to fail.” – Benjamin Franklin. Being prepared (planned) for the day, week, month, quarter or year is vital to a Thriving business. Business Owners can have thousands of things running through their minds daily. The ‘To Do’ lists could be huge and it’s easy to let some slip. We are all human after all! So make sure you lock in 5 – 10 minutes at the start and the end of the day to review your plan and tasks. Record tasks and tick them off! There is nothing more powerful than ticking something off your list! Join our mailing list to receive more valuable resources and benefit from 3 experienced business coaches! 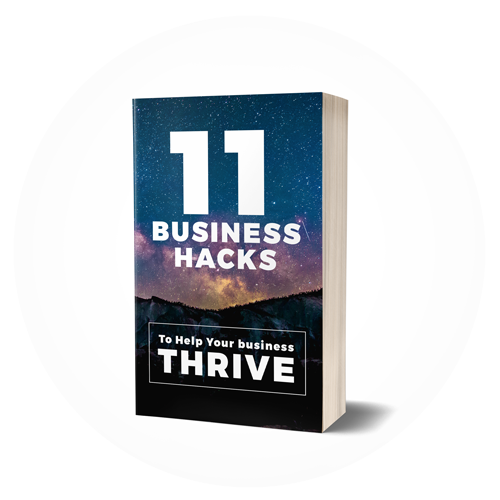 + you'll unlock the 11 Business Hacks!